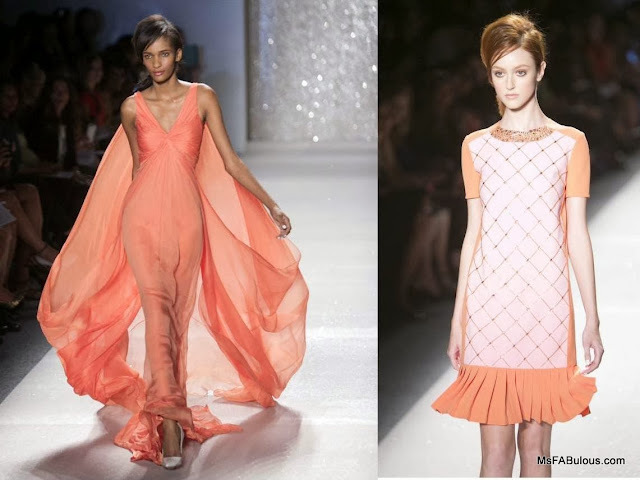 The glamour of 1960's film stars was the inspiration for Pamella Roland's Spring 2014 collection at New York Fashion Week. After attending the Cannes Film Festival last year, the designer wanted to evoke the style of classic movie beauties like Brigitte Bardot and Grace Kelly. The clothes had simple, elegant silhouettes with a clean color palette of white, black, sunny orange, blush and Cote d'Azur blues. Several pink dresses paired with blonde bouffants reminded me of vintage Barbie dolls. There were ladylike shifts and suits along with one particular show-stopping chiffon gown that swirled on the runway in a cloud of coral. I also loved the graceful models who worked the red carpet looks like big puffy taffeta capes and floral fishtail gowns. The signature motif was a honeycomb hexagon pattern that showed up in embroideries and mirror appliques. This added a mod graphic touch to the otherwise sedate looks in some cases. Pamella Roland has never been the most fashion-forward label. I believe her core client is a little more established, a little less adventurous, but that's okay. These are the ladies you can only hope to be when you grow up and achieved all you wanted to achieve. Even if all you wanted was to dance in the sand.